Thanks to the arm slot at the top of the pillow, you can maneuver your arms for comfortable side sleeping. The pillow will help you get rid of shoulder pain caused by pressure from sleeping on your side. Works for side sleepers only. The MedCline wedge is exclusively designed to relieve the symptoms of acid reflux by 87% compared to standard models. A unique arm pocket won't let you slide down during the night. 32" x 30" x 8"
It's wide enough to let you stretch out without falling off the edge. 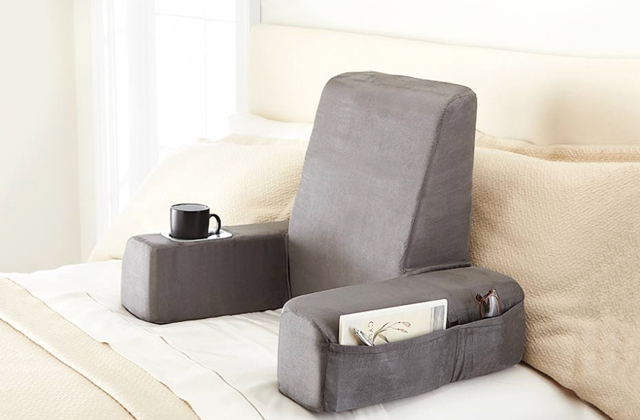 Plus, you can place it vertically for lower back support when you want to read or watch TV lying in your bed. Needs a good deal of time to completely expand. By keeping your head up and your airways open, this wedge pillow effectively combats such issues as acid reflux, heartburn and sleep apnea. A great option for tall and plus size people. 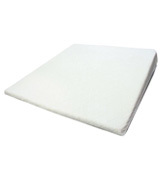 32" x 30" x 7"
Thanks to the built-in ventilation channels between the top memory foam layer and the core, the wedge provides good air circulation and prevents your head and neck from sweating. Right out-of-the-box there might be a chemical odor. 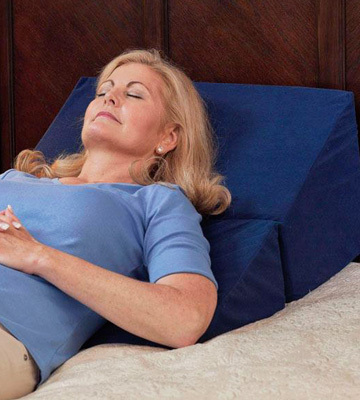 The IntreVision pillow will alleviate your back and neck pain as well as other nighttime ailments. The steep incline is perfect for elevating your legs to relieve the stress after a long day and improve lower-body circulation. Owing to hypoallergenic properties and protection from dust mites, this pillow wedge guarantees you a comfortable and safe sleep. Some customers consider it too firm. 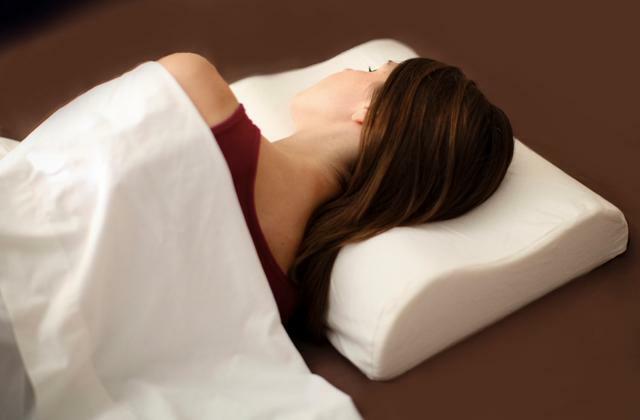 It's all-natural therapeutic pillow that is made of high-quality eco foam! Thanks to gradual incline, you can use it not only for a perfect night’s rest but also for watching your favorite TV shows, sitting on your comfy couch. 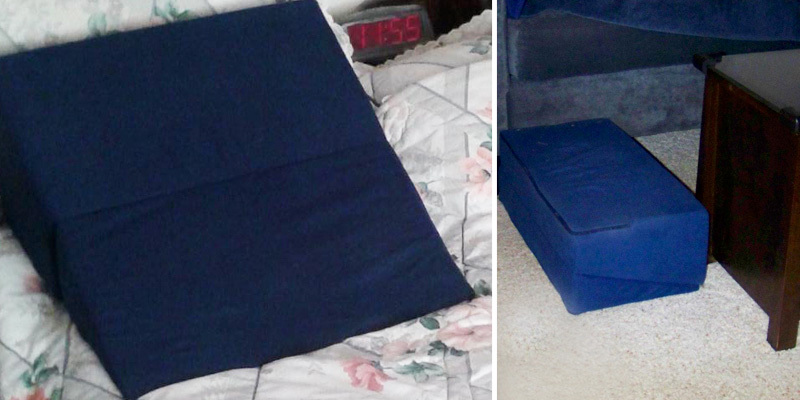 Since the pillow can be folded up into a box shape, you can place it under your legs to elevate them at the right angle to improve lower-body circulation. The Drive Medical pillow incorporates two pieces, so you can fold it and compactly store in your closet or take it with you on a trip. Sleep soundly and wake up feeling rested wherever you are. Are you a side sleeper? 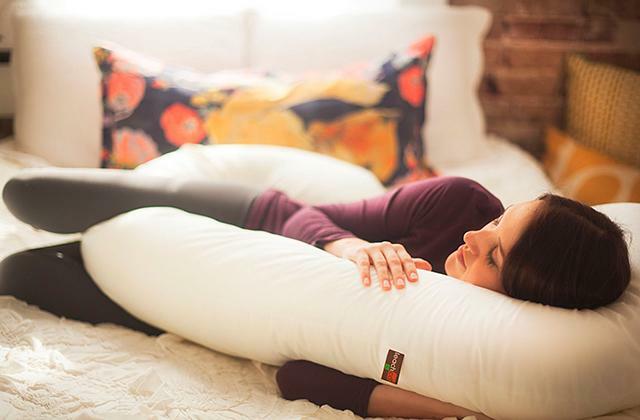 If yes, the MedCline pillow will work miracles for you! It's an innovative wedge with a patented arm pocket at the top which allows you to find a comfortable position for your arms. The arm slot is also very helpful for shoulder relief since it takes the pressure of your downside arm and shoulder. 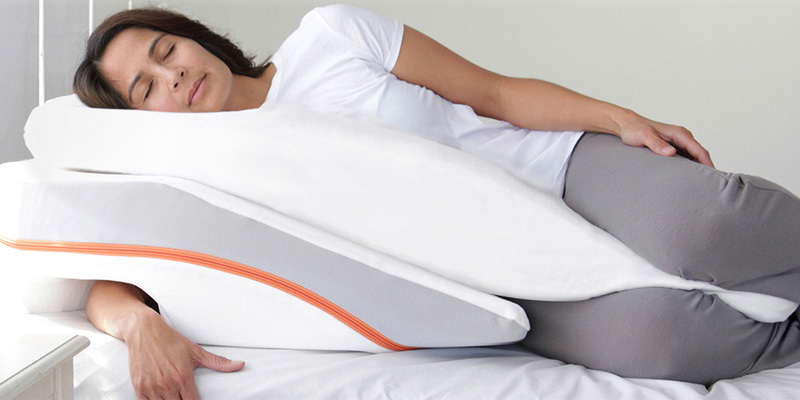 Moreover, once your arm is in the pocket, the pillow will keep you from sliding down. 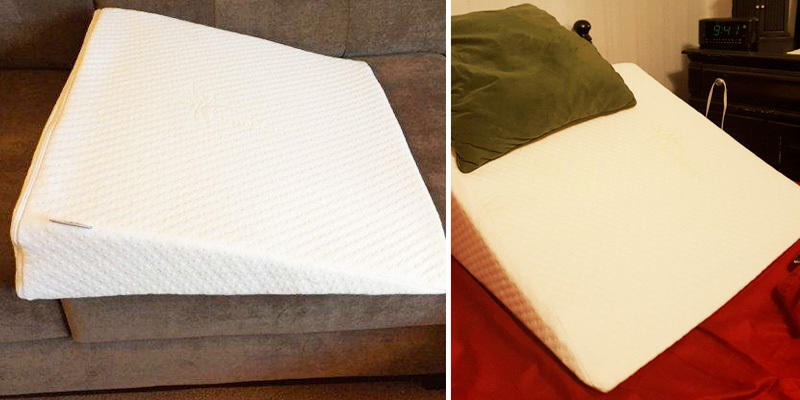 It has been clinically proven that sleeping on this bed wedge cushion reduces exposure to harmful stomach acid by 87% compared to standard wedges. Such advanced wedge offers powerful relief heartburn, coughing, regurgitation, nausea and other symptoms of acid reflux. It lifts your whole torso, elevates your head, and best of all, allows you to use your own pillow on the top for the extra support. 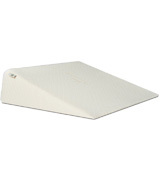 The MedCline bed wedge is made with four types of medical-grade foam. The memory foam top layer provides ultimate comfort and is wrapped in a plush cover that zips off easily for machine washing. 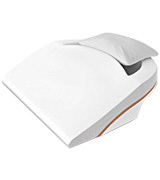 The MedSlant Wedge Pillow is a quality product to help you improve your sleep. Thanks to the incredible length of 32 inches, it provides the perfect support to your torso, not just your head and neck. Thus, this model effectively fights heartburn, night-time reflux symptoms and other issues that might lead to sleep disorders. Comfortable, gradual slope also helps improve circulation and respiration as well as alleviate discomfort during pregnancy. The bed wedge is 30-inch wide and it will be okay with a Queen size bed. 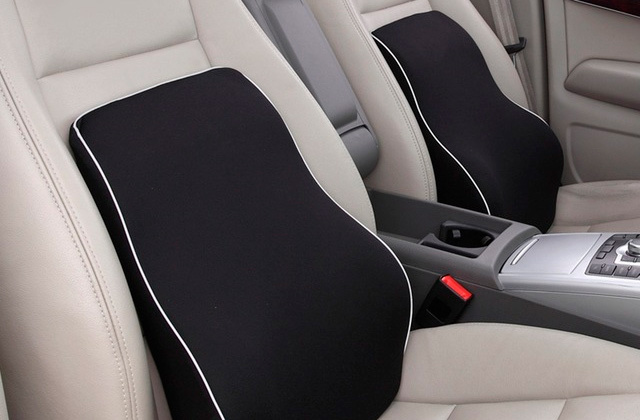 Its core is produced from hypoallergenic and environmentally friendly polyurethane foam which ensures firm, solid support to your head and trunk. Yet, this large wedge pillow is very smooth, soft to touch, and has no uncomfortable bumps. 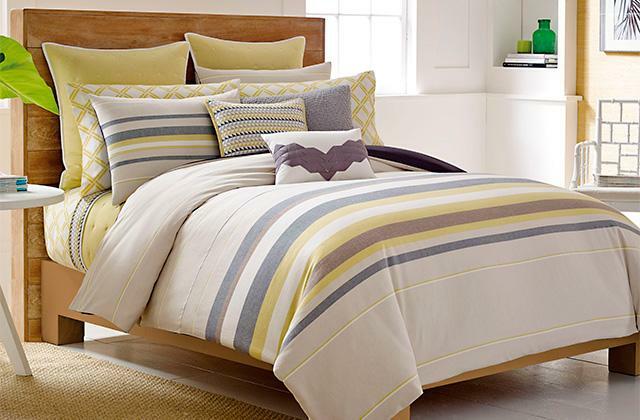 It's supplied complete with a zipped soft microfibre cover that will hold its shape for years to come. 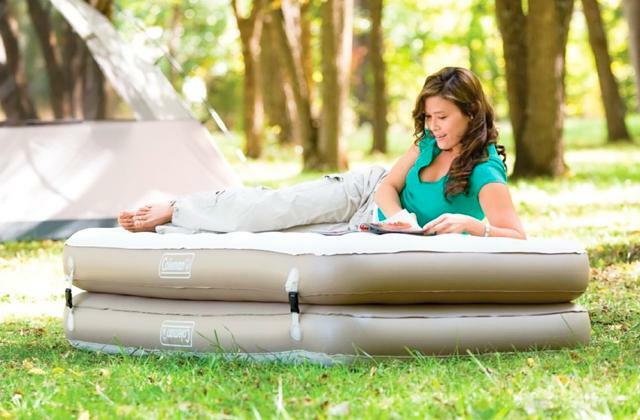 After sleeping on this acid reflux bed wedge, you'll always wake up full of energy and in a good mood. 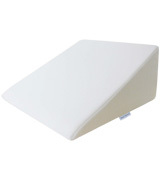 The InteVision pillow stands out from other models with a pretty steep incline. It's 12 inches high and only 25 inches wide, which means it can provide maximum lumbar support and elevate your upper body. Such incline will keep the contents of your stomach from rising into your esophagus, thereby, relieving the symptoms of acid reflux, heartburn, and esophagitis. This steep pillow also helps reduce back pain and breathing issues and provides you with a better night's sleep after a hard day. The pillow is also great for under-the-leg use. By elevating your legs, you'll reduce excessive pressure on your spine, relieve muscle tension and improve circulation. Also, you can experience luxurious comfort while reading your favorite book or watching TV show in your bed with the InteVision wedge pillow. 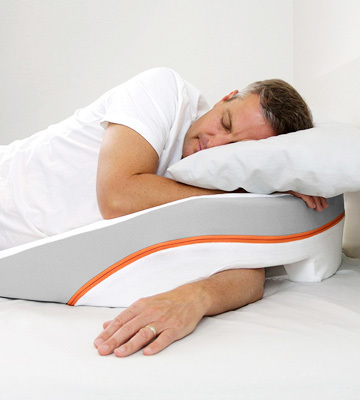 Thanks to supportive upright cushion, you'll get rid of back pain and no longer wake up with puffy eyes in the morning. 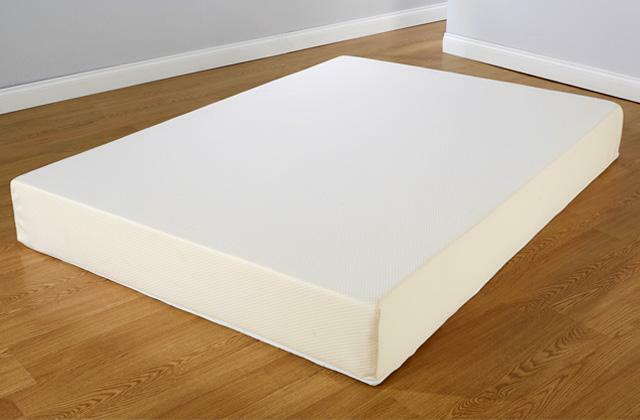 The soft memory foam surface covers a core of high-density, breathable foam. The wedge is firm enough to ensure a correct torso posture and soft enough to contour your body and cradle you throughout the night. It enhances air circulation and reduces head and neck sweating to provide users with superior comfort. 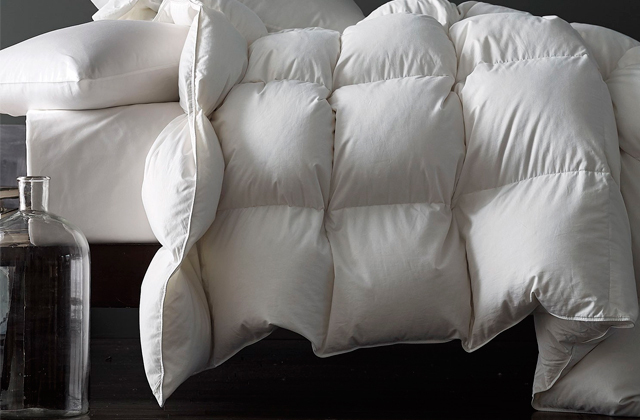 The pillow comes in a soft and washable Bamboo fiber cover that zips on and off quite easily. At 10 inches, the Zuma bed wedge provides a gradual incline to your body, keeping you in a comfortable position. It reduces back and lumbar pain, ease respiratory problems and alleviates a number of symptoms - acid reflux, GERD, heartburn. More so, you can choose a lower 7-inch or higher 12-inch option as well. The length and width of all models are the same - 24 x 24 inches, meaning it's a good choice for people of average height. In case you suffer from swollen legs, you can prop your legs up with this pillow to relieve tension on your muscles, reduce the stress on your heart and improve lower-back circulation. Also, if you place the short side of the pillow against your bed, you can create a comfortable upright cushioning for watching TV, working on your laptop or reading a book. The Brentwood Home pillow is manufactured from CertiPUR-US Certified Foam which does not contain ozone depleters and harmful PBDE, TCEP, mercury, lead and other harmful substances. The core has a low VOC level and is completed with a zipped super soft cover for easy machine washing. Drive Medical offers a wonderful bed wedge for a sound and healthy sleep. At first glance, this model might seem a common pillow with a gradual incline, but this is not the case. 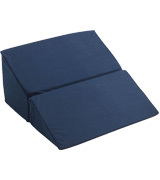 Unlike many other wedge pillows, this one incorporates 2 pieces, allowing you to fold it up into a box shape. This way, you can compactly store the pillow on a shelf or in a closet. Also, you are free to put this box under your legs to increase circulation and take the pressure off your hips and lower back. When unfolded, the model has nice length and width that make only 23 inches. The height is 7 inches, which is quite enough to slightly elevate your head and help you get rid of such sleep issues as heartburn, acid reflux, or even GERD. The pillow can also help snoring problems and provide you and your partner with a restful night's sleep. The wedge core consists of 100% foam that is pretty firm and can give a good support even to a 300 lb. man, while the cover is made of Nylex, soft material gentle for even the most sensitive skin. The covering has a zipper and can be easily removed for laundering. 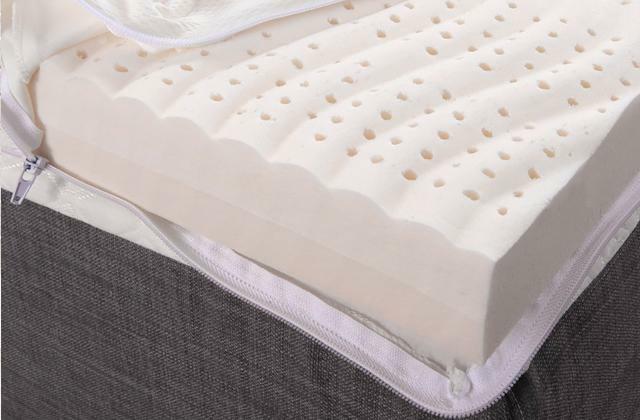 If you suffer from sleep apnea, acid reflux, sinus congestion, or heartburn, a bed wedge is a must. It slightly elevates your head, and gently lift your torso, putting you in an optimum rest position. It aligns and stabilizes your pelvis and lumbar spine, relieving tension on the nerves, muscles, and joints. This kind of pillow can also support your legs and provide relief from swollen ankles, varicose veins, phlebitis, and edema. Wedge pillows feature a slope of some kind. Depending on the health issue you are trying to address, you can choose models with a gradual incline or those with a very steep incline. The pillows are made of firm foam (or memory foam) and they usually come with removable covers that can be machine washed. Such a pillow in conjunction with a good mattress topper will surely improve your sleep quality. And a comfortable body pillow can cradle your whole body and send you down the path towards the dreamland. 1. 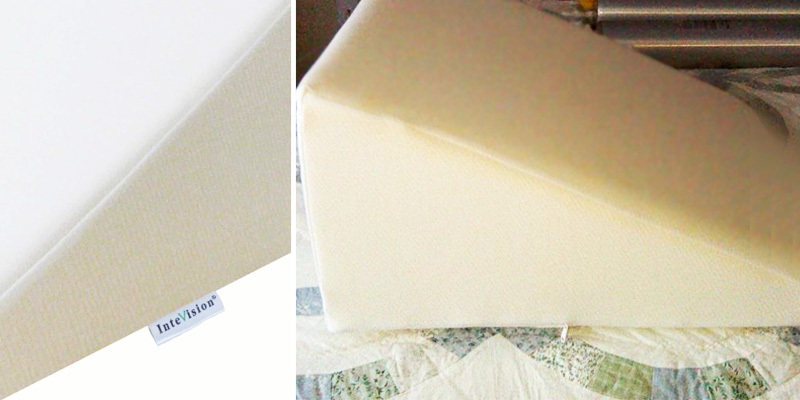 Amanda Mears Everything You Need to Know When Buying a Wedge Pillow, Overstock. 2. Elizabeth Narins 18 Ways You're Sleeping Wrong, Cosmo. September 13, 2014. 3. Nancy Clarke What Are the Causes of Back Pain After Sleeping? LIVESTRONG. 4. Sleep tips: 7 steps to better sleep, Mayo Clinic.